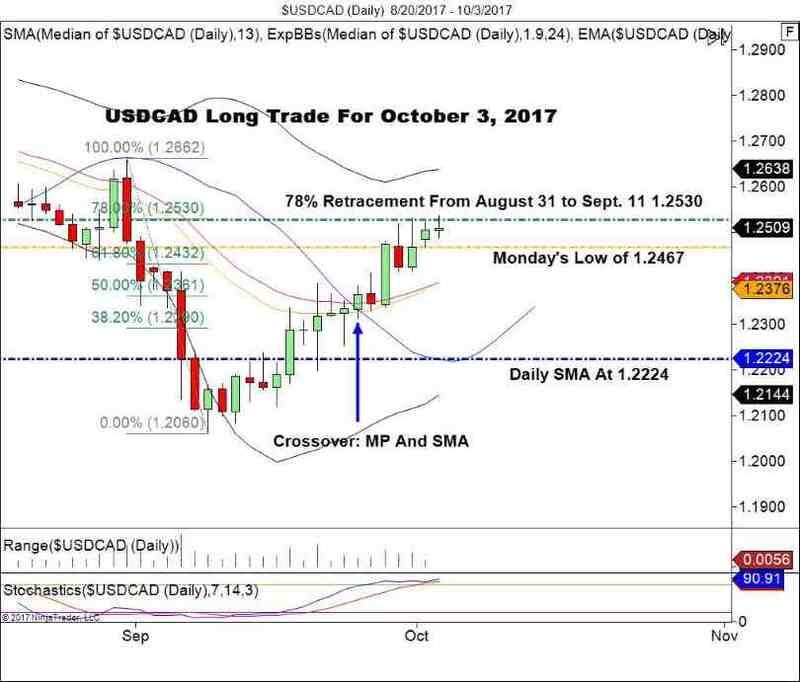 The USD/CAD Is Grinding Higher-Time To Get Long? Macro strength from the dollar is a relatively new phenomenon for 2017. The positive movement has created a few intermediate-term trading opportunities. So far today, the USD is undergoing retracement across many of the majors. Tuesday’s U.S. session gives us an ideal opportunity to take a shot at the USD/CAD to the long-side. The USD/CAD traded in a tight 56 tick range for Monday’s session. Today has shown moderate extension to the bull, followed by subsequent retracement. The 78% retracement from the high on August 31 to September 11 is at 1.2530. Bullish symmetry on the daily chart has been constant since September 22. The key pyschological level of 1.2500 has been an area of high participation for the past three sessions. Since our MP/SMA crossover on September 25, sentiment has been consistently bullish. Bottom line: The August/September 78% retracement level has withstood an initial test earlier in the session. Trade has eclipsed September’s high of 1.2531 before immediately retracing. This is a strong signal that the 1.2530-37 level is a key area moving forward. The Trade: A buy of the USD/CAD around 1.2500 is an affordable way to play a second test of the 1.2530-37 level. A stop below Monday’s low of 1.2467 gives a roughly 1:1 R/R payoff for 25-30 pips. This market may see some volatility on the API crude oil inventories this afternoon. With a bit of luck, this trade will be in the books by then. Trade smart and watch the risk management!